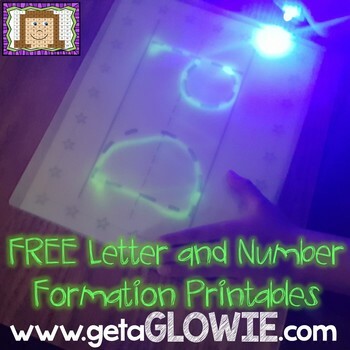 Glowie Mats are a huge hit in classrooms across the country! Just turn off the lights and let students write on them with finger flashlights. These mats are so versatile! They can be used year after year. If you need mats, you can order at www.getaGLOWIE.com. Glowie mats are translucent so you can put ANYTHING under them. This set includes letters in print, d'nealian, and cursive as well as numbers to 10 and a blank writing line. Just print these sheets and lay them under your Glowie Mats.